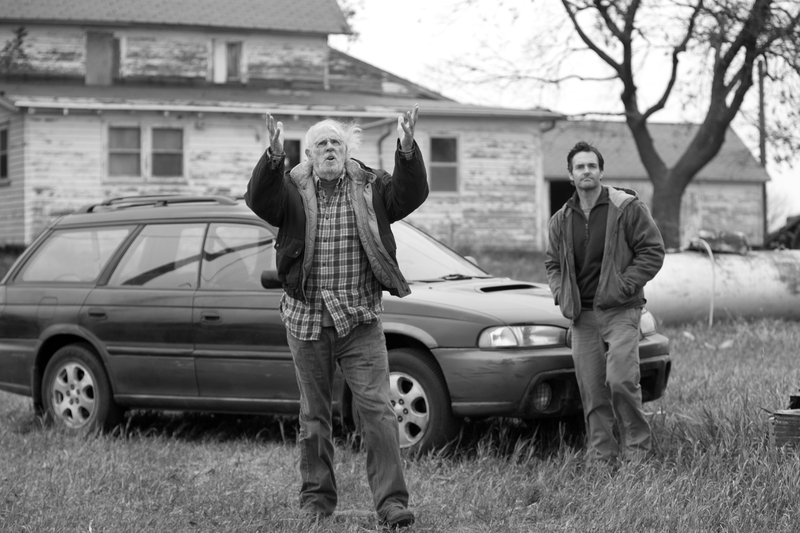 “Nebraska” opens Friday at Sundance Cinemas in Madison. R, 1:50, three and a half stars out of four. Alexander Payne’s “Nebraska” looks bleak. I mean, it was shot in black-and-white in rural Nebraska — how could it not? But dig down beneath those wintry grays, and Payne’s latest is a wonderful and quietly life-affirming film about a dysfunctional family trying to get its act together. Payne is often asked by interviewers how he gets the formula right between comedy and drama in films like “Sideways” and “The Descendants,” as if he’s got two buckets, Comedy and Drama, to mix from. In fact, Payne’s got one bucket, marked Life, with laughter and tears mixed in so well you can’t separate the two. And he draws from it in generous portions. Septugenarian Woody Grant (Bruce Dern) doesn’t seem to have been a cruel parent, just an emotionally absent one. A lifelong alcoholic, he seemed to have lost interest in the world beyond his little garage in Billings, Montana. And that includes his exasperated wife Kate (June Squibb) and two sons, older brother Ross (Bob Odenkirk) and younger brother David (Will Forte). To them, their father is like a boarded-up old house, its interior forever hidden away from the world. Until Woody gets it in his head that he’s won a million dollars in a magazine-subscription sweepstakes from a marketing company in Lincoln, Nebraska. Unable to drive, he sets off on foot from Billings to Lincoln to collect the money, because he doesn’t trust the U.S. Postal Service to handle a million dollars. That Woody distrusts the postal service, but is completely snookered by what is almost certainly a mail-order scam, is one of the many note-perfect details in Bob Nelson’s screenplay. Putting Dern and Forte together is a masterstroke of unlikely casting. Dern, who made his name playing intense motormouth psychos in ’70s films like “Black Sunday,” completely dials down his usual approach, giving almost nothing to the other characters or the audience. In contrast, Forte displays an almost puppy-dog guilelessness, so eager to please his father. The clash between the two is both comic and poignant. “Nebraska” deepens when father and son stop for the weekend in Woody’s hometown, a forgotten little farming town named Hawthorne, Nebraska. As word of Woody’s “windfall” gets around, old friends and distant relatives start coming out of the woodwork. Some offer congratulations, others (like Stacy Keach in a honey of a performance as the town bigshot) claim old debts need repaying. Through all of them, David finally starts to learn about the man Woody used to be, that there was a time when he was generous and thoughtful to others, when he showed love, perhaps to a fault. A key moment comes when the family visits Woody’s old house, a place where his father would beat him, a place where his younger brother died of scarlet fever. In another movie, this would be where Woody’s hard shell would finally come crumbling down, but the scene is more heartbreaking because the armor almost stays in place, aside from a fleeting shadow across Dern’s face. “I was there,” he says, flatly. A native Nebraskan who still lives part-time in Omaha, Payne displays both an affection for men like Woody and towns like Hawthorne as well as a local’s clear-eyed lack of sentiment for them. Hawthorne seems like a hard place, and only getting harder, and Woody is very much a product of that environment. 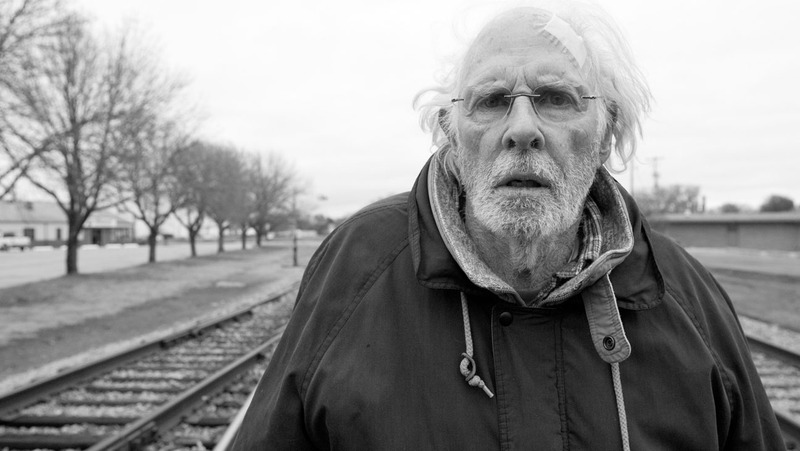 And yet “Nebraska” finds grace notes for its characters, with an ending that’s somehow both upbeat and valedictory. And, I swear, by that last shot, those vast, gray Nebraska skies start to look beautiful.